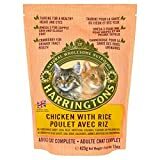 Harringtons Adult Cat Complete Chicken with Rice is a complete pet food for all cats from 8 weeks onwards. What is Special About Harringtons Adult Cat Complete? With Taurine to help support a healthy heart and eyes. With MOS a prebiotic yeast to help support a healthy digestion. With Cranberry, beneficial for urinary tract health. With calcium and phosphorous for healthy teeth and bones. With vitamin E to help support immune function. With omega 3 for a healthy supple skin and glossy coat. With Yucca to help reduce stool odour. This entry was posted in Uncategorized and tagged 425g, Chicken, Complete, Harrington's, Pack, Rice by One Boutique. Bookmark the permalink.